What is the LOWER Function? The LOWER function is categorized under TEXT functionsFunctionsList of the most important Excel functions for financial analysts. This cheat sheet covers 100s of functions that are critical to know as an Excel analyst. The function will return the lowercase version of the text string given. It was introduced in MS Excel 2000 version and is available in all subsequent Excel versions. In financial modelingWhat is Financial ModelingFinancial modeling is performed in Excel to forecast a company's financial performance. Overview of what is financial modeling, how & why to build a model. A 3 statement model links income statement, balance sheet, and cash flow statement. More advanced types of financial models are built for valuation, plannnig, and, LOWER can be useful in arranging data or creating data in a certain format. For example, we can create an email address from the names available in a data set. Th LOWER function uses one argument, that is, text. It is a required argument here. It is the text that we wish to convert to lowercase. The function will not change the characters in the text string that are not letters. So, for example, numbers and punctuations will remain unaffected when we use LOWER. 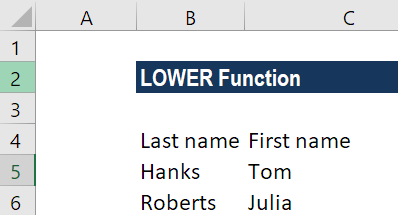 How to use the LOWER Function in Excel? Suppose we imported data from an external source and wish to convert them in lowercase. If we want only the first letter from the first name, we can use the LEFT function. In the above formula, the first name is joined to the last name using the concatenation operator (&), and the result is wrapped in the LOWER function, which forces all text to lower case. Finally, the result we get is joined again to “@” and then to the domain. The domain is kept separate for convenience only.